Scientists from the University of Tokyo and Kyoto University have successfully grown an adult ear on the back of a rat using stem cells. This is a significant milestone for the study, which could potentially use the technology to repair faces disfigured in accidents or help those who were born with facial deformities. Current practices require individuals to undergo a painful surgery in order to remove portions of their rib; the new technique would require just a small sample of cells as starting material – so say “goodbye” to invasive surgeries. The team induced pluripotent stem cells to grow into ear cartilage, which was then placed into a kind of biological tubing that mimicked the shape of an adult ear. 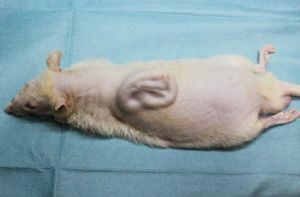 The form was implanted under the skin of a live rat, where it was left to grow for about two months. During that time, the tubes that shaped the ear dissolved and left behind an adult human ear. This is not the first time researchers have used a rat to grow a human body part. In 2013, a research team from Massachusetts General Hospital also tried to create a human ear using bovine collagen and cells from sheep. In that case, the team used a titanium wire frame that was designed to hold the shape of a human ear. Doctors in London also grew an individual’s nose on his own arm, rather than using another organism; however, such procedures seem undesirable to some, as it means having a large lump of seemingly random flesh growing on your body for an extended period. To that extent, this new breakthrough in tissue engineering could help individuals get through this experience on an emotional level. The team also notes that the work will allow us to further explore the possibility of creating body parts apart from the ear, such as windpipes. In addition, the Japanese scientists are saying that, because this ear was created as a living part, in children, it will develop as a child grows. Scientists behind the study are hoping to start clinical trials in approximately five years.